Governance functions are best performed by those closest to the realm being managed, with due consideration for the scope of that realm. So promote subsidiarity such that each governance function occurs at the smallest scale where it can work well. That’s usually the personal or local level, but it can be higher—even global, if necessary. 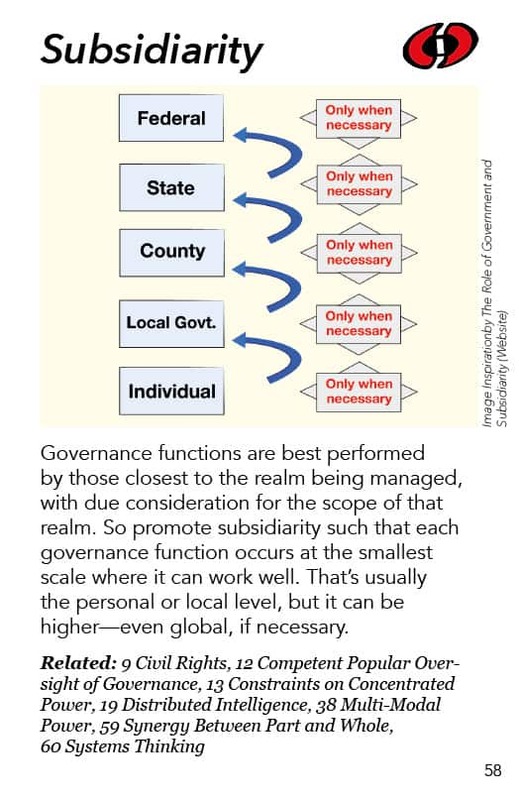 As the pattern states, “Subsidiarity is governance functions placed at the lowest scale where they can best be carried out.” So there is a bias in subsidiarity towards decentralization. I think the concept of subsidiarity arose – or at least spread in political theory – with the creation of the European Union. There are many people questioning how well it has been applied there. Subsidiarity is of course implicit in the concept of a federal system like the United States, where we have a bunch of states and there are lots of states rights – and local powers and personal rights that are not given to the states but are kept by local governments and citizens. The concept of subsidiarity is not clear about exactly how you’re supposed to apply it, but it does a create a principle to use as a measuring stick to strive for. Nowadays there are more and more issues that need to be dealt with at a global level – like managing the atmosphere and the ocean. It’s obvious that you can’t leave control of the ocean to local authorities. That’s proven to be a disaster – and most of the ocean is not local to any particular place. But we don’t have the capacity for true global governance, and we don’t particularly have the capacity for truly democratic – to say nothing of wise democratic – global governance. So this is a very controversial realm, but the idea is still valid. Consider, for example, who should decide what you’re going to be studying as a student. When you are a young child, there should be a lot influence by your parents. And when you’re going to college the choices should be heavily influenced by you. But a society can say “Well, if you study these things, we’re willing to pay you more when you get a job“. In terms of dictating what you study, I personally think that should mostly be a personal decision. But at many ages and in many ways, an individual lacks certain perspective. That’s why they are getting educated, after all. So other people who have more perspective should probably have a say in it. That’s just a superficial example of the kind of thinking we’re dealing with when we try to apply subsidiarity. We’re trying to figure out who is closest to the actual handling of this issue, whatever it is. There’s an assumption that whoever is closest to it, is probably going to be best at managing it. But then there’s the question of who else is involved and you need to engage them too. The more people who are involved, the more scope is probably involved. This is complex, but if you can do this well, it is an important part of a wise democracy. The closer you create the systems to the people who are actually engaged in those systems the more rich and speedy the feedback loops will be. These feedback loops allow for collective learning and moderate abuses of power and if you’re including everybody who is actually involved, then you can include all their perspectives and the area in question gets managed well. Consider human rights: Is that something that you would leave to the local level? If so, can any local community have slavery? That would mean that some communities could decide they want slavery and deprive some of the people in their midst of being able to participate. So if you are trying to develop collective wisdom, you are going to say NO to this. We would tend to want human rights managed at the national or international level because it is such an important aspect of becoming a wise democracy. So that’s the idea of subsidiary. I like its bias towards the zone or scale where a function can be best handled, understanding that small is better as a general principle, but knowing that often you can get too small in your governance, too local, too personal in order to have wisdom applied. There are lots of other people who are being impacted by your decisions when you are doing personal and local decisions, and their voices need to be included also if the decision is to actually be wise. But subsidiarity is a more differentiated and complex concept. It teases out more levels and dimensions of what the Greens are trying to achieve with their word “glocal”. Subsidiarity allows for more in-between-ness – more levels and scales than just local and global, and clarifying the best roles of each and the most functional relationships between them. We can explore what functions are appropriately the responsibility of global or international governance, national governance, regional governance, bioregional governance, state governance, local community governance, neighborhood governance, family governance, and personal self-governance. But subsidiarity could even be applied to networks of people, crossing over all those nested scales. It is like the governance of the Web. ICANN and the other Web-governing institutions are neither local nor global. The question in that case is “In what areas should we have experts and government officials governing the Web and in what areas should we have users governing it?” In a way that’s another question of the scale at which management is best carried out. The same principle applies in business networks. When businesses are trying to decide on something, they need to consider their suppliers and their customers (who may be retailers or final users, depending on the business). What should their roles be? And then there are future generations – what is their proper role in managing a business – or a society? Whatever you’re doing, there’s a way in which subsidiarity is a governance principle that deals with stakeholders. Who are the stakeholders – the people with an interest, the people and groups who will be affected – and what role should the different stakeholders have in deciding what’s going on in a particular realm at a particular scale of space, time, or management?